Rejoice, denizens of the universe! Today marks the 20th Anniversary of Stardock, a company which during that period has given us much reason to celebrate strategy gaming. On this joyous occasion a stellar announcement has been made - the warping in of none other than Galactic Civilizations III! Galactic Civilizations casts the player as the all-powerful leader of a spacefaring civilization that must explore, expand and colonize new worlds across the galaxy. 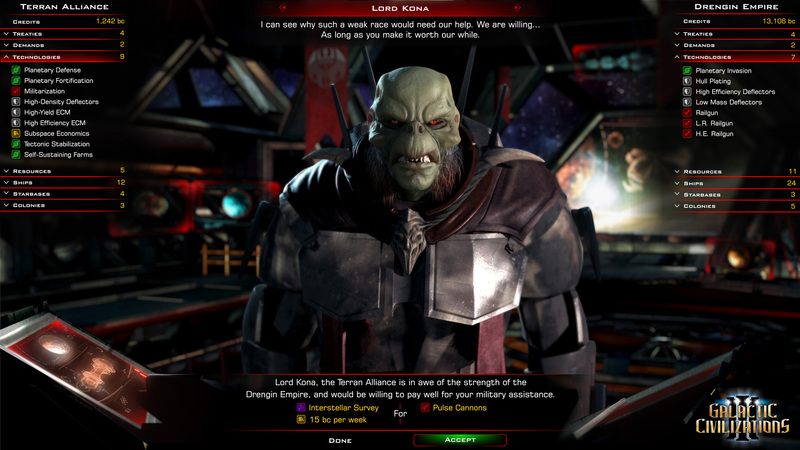 Dominating rival alien species through technological, economic, political and military prowess tests players' cultural, ideological, and diplomatic skills as they pursue victory via peaceful or belligerent means. Galactic Civilizations III gives players far more detail in the textures, models, and overall look of everything from the planets they colonize to the fleets they command. New interstellar terrain elements on the hex-based map like black holes and mysterious Precursor relics change the way players explore the galaxy. A completely overhauled ship builder puts nearly every element of starship design in players’ hands, while the new resource system creates fresh opportunities toexplore, expand, exploit, and exterminate. The whole point of Galactic Civilizations III is to live up to what our fans are hoping for without screwing up the core gameplay that make the franchise one of the highest-rated strategy series in history. So we're adding hexes, because they make better maps. We're putting new stuff out on the map besides anomalies, because it adds depth to how you explore and colonize the galaxy. Diplomacy and non-violent paths to victory have always been key aspects of Galactic Civilizations, so we're adding tons more cool stuff to diplomacy (both mechanically and on the AI side) and adding more ways to interact beyond pushing your influence bubble into enemy territory. The $39.99 Founder's Edition includes beta access, $10 off the regular price, and a special forum badge. The $99.99 Founder's Elite Edition gives players all future DLC and expansions for free as they come out, alpha access, their name in the game's credits, and the right to name a star to appear in-game. Well I'll be damned, this is a surprise... I wonder what wonders were wondered around battles. I hope there is at least a shred of interactivity to them. A new alien race, "one of the races that make up the Iridium", has a specimen on the loose exclusively at Strategy Informer here. I've never caught bug of GC. Played GC1, but still Sid's Civilization was far superior. Didn't play GC2, maybe I'll try GC3. That sense of depth and “soul” is really hard to capture in a game that is primarily a sandbox; you can't force a narrative on the player, or even control the order in which things unfold, so we have to breathe life into each race, each planet, ship, and tech. If we do this right the player writes their own story and feels like the universe they are playing in is theirs. Needless to say this is a big challenge, but it is one of our primary focuses, and we can't wait to see what players do with it. Strategy Informer got Stardock's CEO Brad Wardell to warp in and answer some questions in this interview about Galactic Civilizations III. I mean it’s a single-player game first. We’re not making any promises to have some kind of multiplayer balance or anything like that. If one race is better than the other in multiplayer, well, that’s too bad! We’re not going to sacrifice the single-player. Though I like races being both unique and balanced, something SotS does with excellence. PC Gamer's Kevin Kelly previews GalCiv III. This is interesting though; an interactive timeline! @SV: just take the new in with the old. Have a look at how the fiendish Drengin evolved over the years. jackswift, intraloper: Has the ship combat evolved from the previous installments? If so, what new mechanics or features should we expect? Can we expect some control or tactics this time? Also, will it be possible to inflict damage to individual components which could lead to some interesting results like drifting capital ships with smashed up engines? Ray: We have a new combat system that we are planning for after the alpha. But we don’t want to mislead people – Galactic Civilizations isn’t about fighting long tactical battles. You are controlling a civilization that spans the galaxy and your focus is on producing and placing your fleets, not in giving every order in a battle. We want to keep players engaged at the empire level and fighting for planets and systems, not in ship to ship combat. Now available to the wealthy in the form of a Founder's Elite Edition through the Steam Early Access program. Hmm, graphically this game hasn't changed much (yeah I'm a graphics-whore). Thanks for the video Thor, but after about 15 minutes my head exploded. The Wargamer's Kevin Foley-Friel previews Galactic Civilizations III's Early Alpha. PC Gamer's Richard Cobbett reviews the Early Access build of Galactic Civilizations III.